Once I got into Boston, I took a walk down the Freedom Trail. Someone had the brilliant idea to create a walking tour of several of the historical landmarks, marked by a brick line in the sidewalk. There were a few cemeteries and churches (all of which still had services! ), and quite a few historic buildings. Some, like the Old Corner Bookstore and the Old City Hall, had been converted to eateries, but several had become museums. It was interesting to see the difference in presentation between the Old South Meeting House, which offered a more neutral point of view of its entire 300-year history, and the Old State House, which reminded me of my old middle school history textbook. At the end of the trail was the Bunker Hill Monument, which was an obelisk akin to a smaller Washington Monument. If you wanted to end childhood obesity, just tell every schoolkid to walk up all 294 stairs of the thing in PE class. After getting the tour of historic Boston, I went to meet my dad at the airport. He flew in to join me for a couple days and to finally cross Maine off the list of states to visit. We walked around the city a bit so he could see the sights, and then we took the commuter train to my car where we would get started on our trek northeast. Something that surprised us was how early the sun set, even during daylight savings time. It was completely dark by 7, which was a bit unexpected for early October. 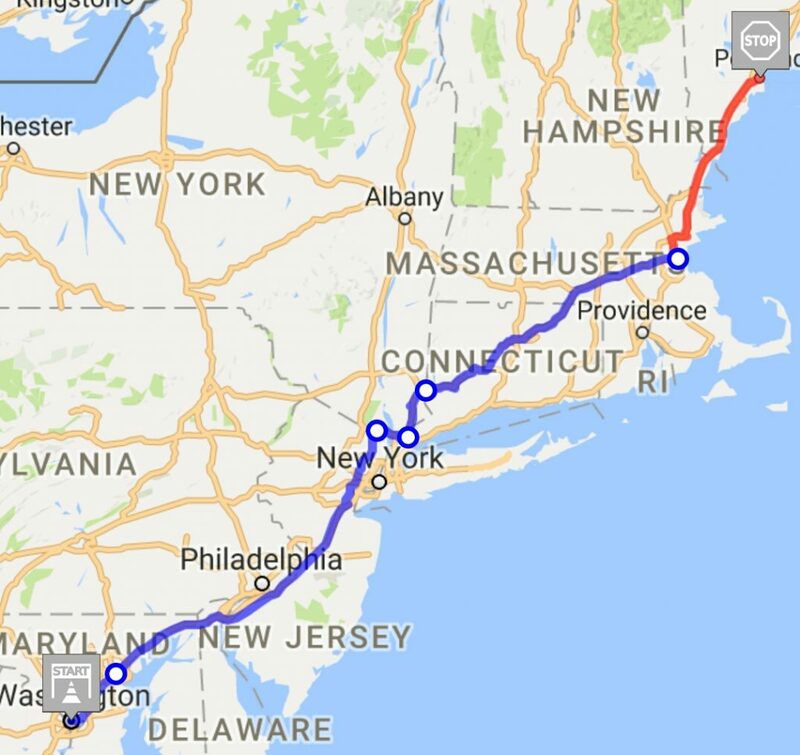 It’s one of the inconveniences of doing this trip in the fall, but logistically it wasn’t really feasible to do it any earlier in the year. Since we wouldn’t be able to make it all the way to Acadia National Park until around 1 AM, we decided to split the trip in two. There was a campground near Portland about an hour and a half drive away, and from there we could finish the leg the next morning. When we got to the campground, we discovered that they would only take reservations for RV sites and not for tenting, much to my dad’s bemusement. With our original plan thwarted and it being past 10 o’clock, we conceded that we would have to spend the night in a motel. Our first night of camping would have to wait until tomorrow. Boston State House. I spent about ten minutes there wondering why it was closed before I realised I had it confused with the Old State House. Hopscotch from the first public school in America. I’d show you the whole thing, but Instagram is being a square. The Old South Meeting House, surrounded by modern Boston. The view from the top of the Bunker Hill Monument. My old stomping ground. I lived on Commonwealth between Dartmouth and Exeter for a while back in ’87. Ah, RV-only campgrounds… they’re are a pain, aren’t they? I don’t know if I’d want to spend a night outdoors in Maine in October, though. Your sleeping bag’s rated for sub-freezing temperatures, right? Also, it’ll be interesting to see what range of sunset times you encounter on this trip. The north/south variation will only increase as winter closes in, but I wonder if it’ll be wide enough to notice amidst changing time-zone offsets. At least you won’t be weaving back and forth between Central and Mountain time for a week like I did.